My favorite April Fool's Joke this year? 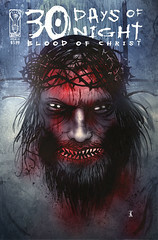 Ben Templesmith's "30 Days of Night: Blood of Christ" For a split second I thought it was real, and was ready to call Lee's and ask them to put it in my saver. Also, welcome back Lex! Lex's original Beyond The Sea blog was taken down by WordPress.com, but he's back at beyondthesea2. Lex maintains the best J-Pop review blog I've seen. I missed all the drama because I let my rss feed do the polling. I thought Lex was just being inactive for a while.